It started as a West County wine shop and evolved into a popular boutique eatery. 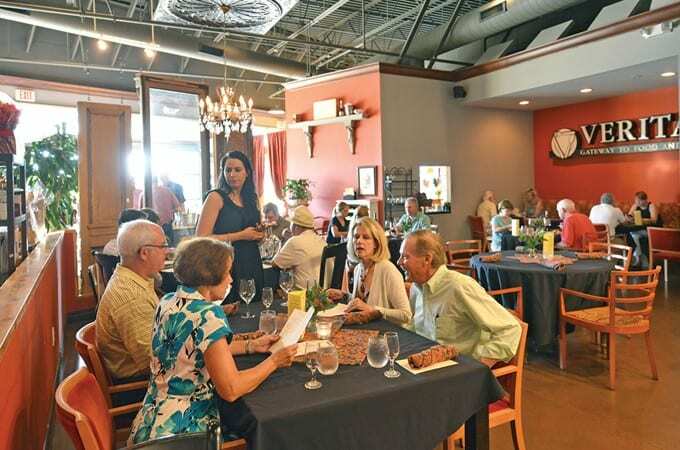 Now, 10 years in, Veritas is still fulfilling its vision as a friendly gathering place where people can enjoy their favorite bottle of wine—and sample some new ones—during a leisurely evening with friends. Oh, and there’s the food, provided by the founders’ son, Mathis Stitt, who studied at the New England Culinary Institute and came back to create enticing fare to go along with the wines. The chef’s food is memorable—creative and technically well-executed with optimal flavor. The locale has its challenges. It’s in a strip mall in Ellisville between a Salon Lofts and tanning spa, so dining on the patio is rather sterile. But the Stitts have managed to make the inside homey with dark lighting, two inviting bars and an open kitchen where diners can watch their fiddlehead ferns and pickled eggs being prepared. A starter of Escolar Hushpuppies ($11) was irreproachable, the well-crisped puffs bursting with cornmeal flavor and, every so often, a flake of fish. Each came topped with pungent red pepper mustard and chopped kalamata olives. Another, Avocado Gazpacho ($9), exemplified what an appetizer should be: a teaser to pique the appetite. A pureed soup of avocado and cucumber came with tomato relish, a few grape tomatoes and arugula leaves, and a topping called ‘spicy bacon sauce,’ with meaty, crisp and spicy bacon. The blend of tastes and textures was fascinating. Do not miss the Spicy Braised Pork ($26), if it’s offered. Served in a wide bowl, the browned, appetizing pork shoulder meat was fork-tender and fragrant with 5-spice powder and a little bit of heat. It came nestled on some of the best grits ever: carrot curry brown butter grits, which were saffron-hued and every bit as buttery as they sound. Also scattered about: roasted Brussels sprouts, oven-dried tomatoes, house-fried tobacco onions and pickled mushrooms. When each component of a dish, down to the lowliest onion, receives this kind of culinary attention, you know quality is at work behind the scenes. That was also the case with our Wild Ramp Tortellini ($22), giant pasta knots sitting in a delicate herb sauce. The pasta was house-made, if a little thick, and adorned with mushrooms, ramps (an onion-like root vegetable), pecans and fiddlehead ferns. It was a creative dish, as well as a delicious one. Nothing is as appealing on a piece of fish as a well-browned top crust, especially when it’s laden with butter and enough salt to be noticed. The Pan-seared Grouper ($29) was a superb fillet placed over slices of tomato, avocado, celery, basil and parsley in a light, sweet honey pimiento sauce. The fish had amazing flavor, especially since every bite included a piece of that crunchy top crust. If I had a complaint, it would be size. Something more was needed, maybe a starch since the fish was barely 4 ounces. Another winner was the Amish Organic Chicken Breast ($23), which came with an array of impressive touches, each getting its own royal treatment. There were fried green tomatoes in a crunchy cornmeal crust, oven-roasted Brussels sprouts, butter roasted radishes and a creamy dab of lebneh (strained yogurt). The chicken, an airline breast, was moist and wrapped in crunchy, delicious, fat-infused skin. favorite ingredient | I’m excited about the upcoming corn season. most memorable dining experience | Pok Pok in Brooklyn. It’s South Asian street food; fine dining with a twist on foods I knew little about.